As I’ve mentioned several times before in this blog, I did a talk about Rockbox and reverse engineering at Fosdem 2010 Feburary 6-7 in Brussels, and since there was no “pre-arranged” video recording of the talks in the embedded devroom, Peter D’Hoye stepped up and recorded the whole thing using his Nokia n900 phone. I decided to not make the slides for this talk available separately, as they were more or less the same as the ones I used for my FSCONS 2009 talk, so you can go watch them instead if this video isn’t enough! To view it, I suggest you use VLC or similar and tell it to stream directly from one of these URLs, the file is a 1.1GB one with 848×480 resolution running for 51 minutes. Annoyingly, none of the usual free online video services allow this long ones. We’re proudly presenting a major new release of curl and libcurl and we call it 7.20.0. We fixed a potential security issue, that would occur if an application requested to download compressed HTTP content and told libcurl to automatically uncompress it (CURLOPT_ENCODING) as then libcurl could wrongly call the write callback (CURLOPT_WRITEFUNCTION) with a larger buffer than what is documented to be the maximum size. TFTP was finally converted to a “proper” protocol internally. By that I mean that it can now be used with the multi interface in an asynchronous way and it has far less special treatments. It is now “just another protocol” basically and that is a good thing. Also, the BLKSIZE problem with TFTP that has haunted us for a while was fixed so I really think this is the best version ever for TFTP in libcurl. In several different places in the code older versions of libcurl didn’t properly call the progress callback while waiting for some special event to happen. This made the curl tool’s progress meter less responding but perhaps more importantly it prevented apps that use libcurl to abort the transfer during those phases. The affected periods included the ftp connection phase (including the initial FTP commands and responses), waiting for the TCP connect to complete and resolving host names using c-ares. The DNS cache was found to have at least two bugs that could make entries linger in the database eternally and in another case too long. For apps that use a lot of connections to a lot of hosts, these problems could result in some serious performance punishments when the DNS cache lookups got slower and slower over time. Björn and I left work on the Friday afternoon and took a flight down to Brussels, Belgium. 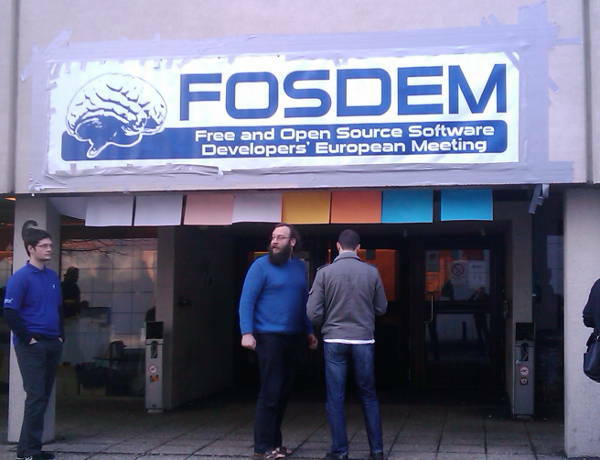 After having checked in to our hotel, we met up with Frank from the Rockbox project and we headed to the Fosdem beer event that took place on a pub quite nearby to the hotel. For us tech guys, the Saturday morning had no really exciting subjects and weirdly enough the morning had only one track and the massive amount of parallel tracks didn’t start until after lunch. 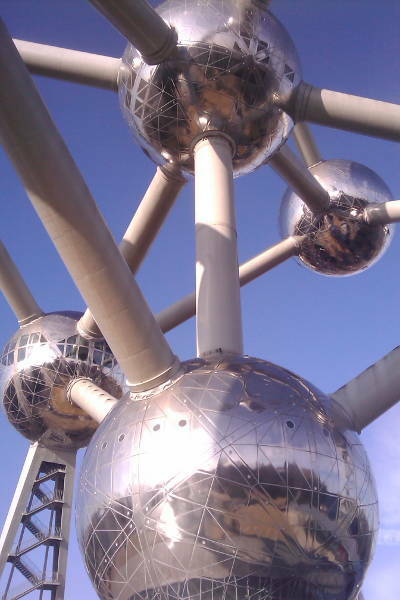 This gave us an opportunity to go sight-seeing, and we visited the city square and the Atomium before we headed into the FOSDEM premises and squeezed our way in to a presentation. Peter Stuge from the Coreboot project explained to us that we were by far too many people crammed into that little room so if one of the responsible guys would come around a fair lot of us would get thrown out of there. With that heads up given, he started his talk and gave us insights in what coreboot is, what it does and so on. I’ve heard Peter talk about this topic before, but he’s still a good talker and the topic still is techy and interesting enough to listen to. 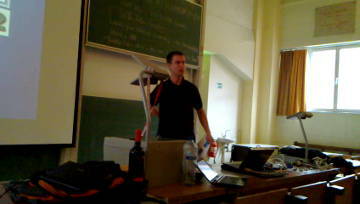 Embedded software development best practices by Adrien Ampelas turned out to be a bit boring. Basically we got the feeling that Adrien re-used a company slide show or something and told the audience a lot of things I bet the majority of people already knew. Yes we know we must use version control. Yes we know we should send patches upstream. No we don’t agree with you that there never exist any reason not to use git. Flash enable BIOS reverse engineering by Luc Verhaegen gave us an insight in the x86 based reverse engineering they do in the Coreboot project to figure out how to enable flashes and to make them possible to write to when you want to upgrade them to use Coreboot. It was only a quick run-through, but my general feeling was still that compared to Rockbox-style reverse engineering, their tasks actually seem a lot easier! Still interesting, as Luc is a good speaker. Sunday morning started earlier than yesterday. Interesting talks started right away, and we actually were too slow at breakfast so we missed the first part of the interesting Introduction to RTEMS talk by Thomas Doerfler. RTEMS is a fully open source RTOS that’s been around for ages and that has some very good realtime skills and can get shrunk to a rather small size. A slight downside with it is its slightly odd license, as it is a GPLv2+ license with a rather big exception that is made to allow proprietary applications link with it. It makes it incompatible with regular GPLv2 code. The RepRap project was presented by Adrian Bowyer and I must admit that these 3D-printers are mighty cool and even more fun to see and witness in the real world than they are to see on tiny pictures on web sites. Back in the embedded room, Roberto Jacinto told us about apt-get for android – with GUI which pretty much described the Aptoide project. It has nothing in common with apt: it doesn’t do dependencies and it doesn’t use its file formats. It has some pretty significant bugs still, and it generally seemed like a rather immature project that I’m not even sure I agree is on the right track. I’d rather actually see the real apt-get for android, with or without GUI. The Cross build systems: Present & Future workshop could’ve become interesting. A lot of projects (PTXdist, Buildroot, Crosstool-NG, Openembedded, Emdebian etc) spoke about what they are, what they hope to do and how they’d like to collaborate. Unfortunately it took a bit too long time so by the time all had presented their projects the time was pretty much up. The most controversial and slightly off-topic of them all was Andy Green (formerly involved in Openmoko) who talked about how we all should stop cross-compiling and build directly on the target instead(!) and how booting Linux shouldn’t need a boot-loader and that designing PCBs with NAND is stupid(! again). I didn’t hear anyone agreeing with his ideas. Next up was my talk on Rockbox. I did it in about 40 minutes and I think I covered a bit of what Rockbox is and how we work when we work with new potential targets. It later struck that I should perhaps have had a slide about what the future holds etc, but hey I think it went pretty smooth anyway! Peter recorded my talk on his n900 so hopefully it’ll soon be available online somewhere. After my talk we met a lot of guys wanting to talk Rockbox, ask about particular players and so on and it was mighty fun and interesting. Greg Kroah-Hartman did the final talk and he is a very good and engaging speaker that really can catch the big audience in Fosdem’s biggest room. Write and Submit your first Linux kernel patch is his “standard talk” but he’s doing it so good and with such elegance that it is a pleasure to watch and learn from. And I’ll admit I wasn’t aware of the get_maintainers.pl script in the kernel tree. A very useful little thing! Lack of gaps – there’s a problem when all talks in all rooms are made gapless. It makes people get up and leave 5-10 minutes before the end of each talk so that they will get in time to the next talk that will start on the full hour in another room. It causes pretty much all question-sessions towards the end to fail since the questions (and answers) can’t be heard. Hard to find people – it is such a huge event and lots of people I have no idea what they look like, so trying to meet friends and people I’ve only emailed with or chatted with on IRC is very hard. Name tags would be really cool. I did have some benefits from using my shirt with a big Haxx logo on the back since a fair amount of people recognized it and approached me! Audio systems – the quality of the different rooms varied a lot (not only sound-wise but the sound was what bothered me). Unfortunately for me, the embedded room was one of the worst ones when it came to audio. It was a big room sure, but the biggest room had an excellent audio system and thus proved size is not what matters. In this case, I think a lot was to blame on the actual microphone we had there. Phone apps – having phone apps with the entire schedule and a little map for each room etc was a great service. The app also reminded us when a talk you had marked as “favorite” was about to start. It was a bit strange though how the android and n900 versions of the app differed. The n900 version was buggy and slow, but it did offer the schedule in a time-based view while the android version only allowed us to view the schedule based on rooms. Next year – yes. I think it was great fun and I will really try to attend next year again. Hopefully other friends will too, since meeting friends at the place really doubles the fun! Thank you all for a nice event!